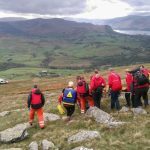 A 70 year old gentleman, walking with a friend suddenly collapsed on Sale Fell, with a heart attack the likely cause. Two passing walkers who were First Responders administered CPR, and a passing fell runner ran down to The Pheasant Inn to direct emergency service vehicles. Because the location was on the boundary between both teams, Keswick and Cockermouth MRTs attended, along with the Great North Air Ambulance, Helimed 58. Despite the speed of response, and the expertise that could be brought to bear, the gentleman could not be saved. His body was stretchered down to the Forestry Offices at Piel Wyke to be transferred into the care of the Police as part of the Fatality Protocol. The Team then returned to base.